Let’s be real. In the midst of midterms and winter quarter coming to a close, the majority of college students are not up-to-date on all the latest Oscar’s drama, much less have had the time to watch all of the award-nominated films. 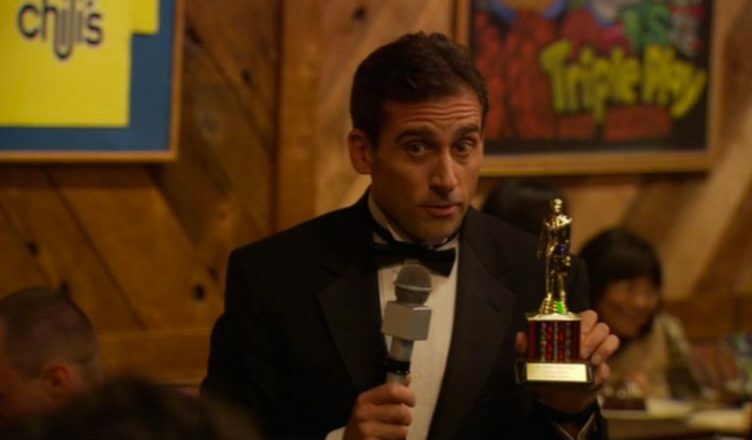 We do know, however, that in times of trouble and stress there is only one true source of comfort: rewatching “The Office.” The Guardian Arts and Entertainment staff, therefore, have taken upon ourselves to present to you the only awards that really matter: The Office Oscars (this is as close to the real Dundies it gets, folks). “Beautiful Boy,” or “Michael Scott (Steve Carell) reacting to Timothée Chalamet crying, making out, doing drugs, and embracing the curliest of hair curls” is basically what you expect — a somber drama about a dad and son struggling with the son’s drug addiction — and nothing more. Obviously, there’s fine performances from Chalamet and Scott, and between the two are a number of touching moments. Whether it’s an addiction, a dysfunctional relationship, depression, or just growing up, there’s a lot someone can relate to in this film. Michael, in particular, exchanges his egocentric, high-strung act in exchange for a softer “dad next door” look. He goes from being someone you’d not want as your boss to someone you’d wish was your dad. Still, tear-jerking scenes and above-average acting and cinematography are not enough to make a great or even a good movie. Granted, “Beautiful Boy” is based off a true story, but its messy writing and uninteresting dialogue belonged to a movie of a B-level caliber. Yes, the “addiction is an illness” story is a commendable one to tell, but the movie’s execution of it does not set the film apart from other biopics wrestling with the same conflicts. But if you, like 95 percent of the movie’s audience, are there for either Elio Perlman or Michael Scott, then you won’t be disappointed. The movie itself won’t turn heads like “Call Me By Your Name” or “The Office,” but its two beautiful boys — I mean, talented actors — sure do. Do you remember that scene in “The Office” when the entire office maintained a silent streak of 14 minutes? Imagine if that scene had much higher stakes and only featured Jim Halpert, and you’re looking at the Oscar-worthy film “A Quiet Place.” Directed by and starring Jim Halpert (John Krasinski), this film is a true masterpiece of the thriller-suspense genre. It centers around Halpert’s family (assumably a new one after Pam, since this one features Emily Blunt as his wife) in the midst of an apocalyptic midwest town. The town, and presumably most of the country, is under attack by long-limbed, vicious creatures that are attracted by any sounds that are louder than a whisper. Accordingly, Halpert and his family live as silently as possible, communicating only via sign language, walking barefoot, and using an array of signals for emergency communications. Jim’s performance in this piece is notable for how much he was able to express with his body language and facial expressions — a talent he no doubt developed during his duration in “The Office.” It is evident from the very beginning that he remains the loyal, determined, and courageous Jim we all know and love, and that this apocalyptic twist of events only made him stronger. Not to mention that due to his skilled directing style, viewers will be held in constant suspense due to being made hyper-aware of every sound, including their own breathing. Overall, “A Quiet Place” is worthy of many awards, but its most notable aspect is Jim Halpert. Clint Eastwood’s “The 15:17 to Paris” is a biographical account of the 2015 Thalys train terrorist attack and stars Spencer Stone, Anthony Sadler, and Alek Skarlatos as themselves. It also casts Pam Beesly (Jenna Fischer) in a supporting role as the mother of Skarlatos. The film itself is drawn out, spending more than half of its screen-time building up to the central action. It also gives the impression of incoordination as the stars of the film are ameteur actors. Yet, in spite of the failures of the film, Pam offers a stellar, though short, performance as an overprotective single mother. Part devout Christian, part entitled parent, Pam’s character displays a variety of acute emotions in response to different situation throughout her performance. She is able to exert intense anger and annoyance at academic staff for their reasonable concern for her child yet also exhibits absolute love and compassion for Alek when he confides in her. Pam’s performance simultaneously imparts a succinct explanation for Alek Skarlatos’s troubled youth and stirs sympathy for both him and his mother. Even though Eastwood’s film is doomed by its extensive exploration of the stars’ backstories and the oversaturation of beginner actors, the performances of the professional actors that Eastwood did cast are compelling. Pam’s performance as Skarlatos’s mother stands in sharp contrast to the rest of the film and gives “The 15:17 to Paris” the award for Best Film Starring Pam (not playing Pam). “The Meg” is a sci-fi thriller released this past summer starring Jason Statham, alongside a diverse cast that includes Dwight Schrute III (Rainn Wilson). On the surface, “The Meg” has all the makings of a great thriller: a bankable action-star protagonist, a high movie budget, and an enduring, modern classic subgenre of shark attacks. Yet, a deeper dive, reveals that the film is just so horribly confusing. The action and the fast-paced cinematography seems to reinforce the film’s thriller status. Yet, the predictable plot and overt interjection of comedy make “The Meg” a seem like a high-budget incarnation of a ridiculous direct-to-TV B movie shark spoof. “The Meg” is a comedy masquerading as a thriller with an inflated budget. However, while the genre direction and character development certainly are disappointing, Dwight does enhance the comedy in the film. Instead of being an assistant to the regional manager at Dunder Mifflin, Schrute is cast as an eccentric billionaire investor, one adept in social skills and interactions. The presence of a malicious villain is replaced by comic relief as shots of Dwight butchering the Chinese language, yelling, and trying to kill the shark litter the film. He makes an otherwise mediocre film more enjoyable through plenty of one-liners, awkward interactions and also just because he’s Dwight from “The Office” and it is impossible to see him in the film as otherwise. A feel-good comedy about a group of friends who travel the country for an everlasting game of tag is just what was needed for 2018. New ideas in cinema are hard to come by recently, and this film was a breath of fresh air. The underlying message of being in control of one’s own youth was heartwarming and beautiful to watch on screen. The concept of a group of professional men entirely abandoning their workloads to crash a friend’s wedding for the sole purpose of making him “it” is absurd in the best sense of the word. Walking out of this movie, one will find themselves fondly holding onto their oldest friendships and evaluating what it truly means to grow up. The casting of Andy (Ed Helms), playing the role of Hoagie, an overgrown child could not be more fitting. It seemed as if the film was merely a display of what one may find Andy Bernard doing in his time not spent at the office. Andy gave a truly remarkable performance as his on-screen presence and energy could not be ignored. Of course, Andy could not be the only office representation in the film, which also featured Karen Filippelli (Rashida Jones), playing the role of Cheryl. She plays the love interest of two of the film’s leads and does so wonderfully. As a whole, she does a commendable job with the screen time she has and continues to present her nonchalant charm. Aside from the film being a total happy-go-lucky, enjoyable film, it is always exciting to see the cast of “The Office” outside of Scranton, PA.
“Ocean’s 8” has since been praised throughout 2018 as a worthy addition to the Ocean’s franchise, as a big step for movies about women, and as just a good heist film. But, new to its accolade resume — it was by far the best picture this year to feature resident gossip and pop culture know-how Kelly Kapoor. Kelly (Mindy Kaling) seems to be in a different part of her life than when we left her after the 9th season of “The Office.” No longer off with Ryan doing whatever, Kelly has transformed into a soft-spoken jewelry maker with a new assignment — dismantle a priceless necklace in the heist of the century, and along the way, grows more confident and even gets into Tinder, like we all deserved to see from a 2018 Kelly. The film well earns its feminine twist on its older compatriots. Clever schemes are made by beautiful women, witty lines keep the audience laughing, and the team attends the Met Gala in dresses nearly as dazzling as the stolen jewels. A heist film with all the glitz, glamor, and glory that one could hope for, “Ocean’s 8” has no shame in pointedly reveling in the aesthetic of large-scale crime and luxury. Kelly would certainly approve.